This was originally published at Planet Change on Monday, October 11. Walking off the plane the other day and into the Beijing airport, on my first-ever visit to China, I was immediately struck by how smoggy it was outside. Even stranger: the inside of the airport had a layer of smoke in it that I couldn’t decipher. Either it was cigarette smoke or factory smoke, most likely quite a bit of both. After grabbing my luggage and some yuan (cash), a man approached me and said he would take me to a taxi. I asked him about the smoke and he said it was all from cigarettes. After getting in the taxi, we drove for about 45 minutes and I was shocked when I realized we had already been driving downtown for several minutes. I hadn’t even noticed the tall buildings through the haze that was so thick that visibility beyond the roads was pretty non-existent. What surprised me even more, on my one day off for this work trip, was that the smog never relented all the way to the “Mutianyu” portion of The Great Wall. Considered one of the most well-preserved sections, Mutianyu is located, by car, about 80 minutes north of downtown Beijing. But the surprises seem endless in Beijing. On my third morning, I woke up to amazingly clear, blue skies. It stayed that way all day, and my colleagues suggested it was a mixture of the previous evening’s rains and wind directions that had cleared the pollution. 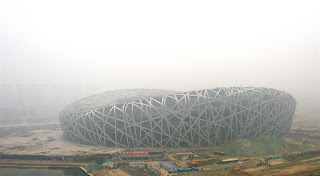 The many, many programs implemented, mostly since the 2008 Beijing Olympics, are encouraging and inspiring. There are about 400,000 “yellow label” vehicles in the region with high-emission levels that are not allowed in the city, “cloud seeding” to increase the likelihood of rainfall is performed when the air needs to be cleared before large events, hundreds of thousands of trees have been planted, and about 4,000 natural-gas buses are now in operation. 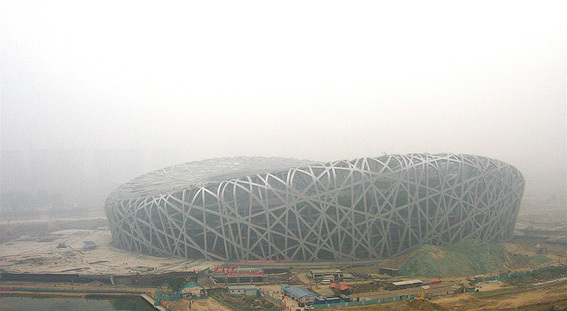 While Beijing still has a way to go to clear its air, there are promising steps being made. My first three days here (two days of smog, one day of clear skies) seem to be illustrative of the problem.